I want to share a lesson that I learned from the Braden program about leadership development. We talked about how among white anti-racists, there can be a tendency to critique organizations from the sidelines, which at best moves other white people to a place of guilt, and at worst creates a culture of individualism and opportunism that completely undermines our ability build collective power. 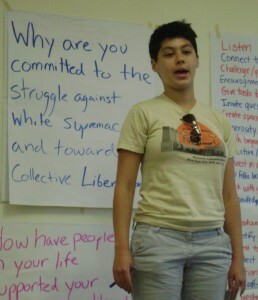 In the Braden program, we talked about the necessity of white people bringing anti-racist leadership to our movements by supporting the political leadership of working-class communities of color, and by winning the hearts and minds of white people to the struggle against white supremacy and for collective liberation. We are trying to think about collective liberation in broad humanist sense, but also in a material sense, and a key part of that is building the power of those sectors of white people who are not benefiting from this system–working-class white people, women, queers, and Jews, many of whom are providing leadership in this struggle. And while we talked about leadership development as it relates to white anti-racists, we are building an understanding of it through the legacies of Ella Baker and the Civil Rights Movement, the freedom fighters who helped to create mass organizing and participatory democracy in the United States. As we struggle to build power in a period in which the left faces a crisis of organization, I think this lesson about leadership development is one to really hold, and I want to appreciate the Catalyst Project for helping to carry that spirit.